It is important to remember that not all calibration laboratories provide the same type of calibration service. 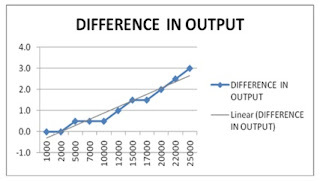 For load cells calibrated in compression there may be a noticeable difference in output. The output is dependent on the calibration fixtures used at the time of calibration, the alignment of the UUT (unit under test), the hardness of the top adaptor used, etc. These are all potential topics for later blogs. In this blog, we are going to discuss how loading through the bottom threads in compression may affect the output on certain types of load cells. For some labs, it is standard practice to load flat against the base, while other labs may load the cell through the threads. 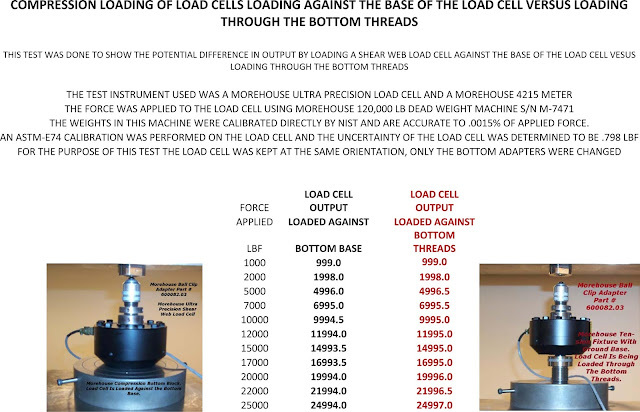 It is important for you, the end user, to know if your load cell was calibrated against a flat base or through the bottom threads; it could make a difference. At Morehouse, our standard procedure is to load a cell flat against the base, as seen in the picture on the top left. We are aware of other labs whose standard procedure is to load the cell through the bottom threads. For shear web type load cells there is a difference and that we can put a number on the potential difference between these two calibration methods. For the test above, we took a standard shear web style load cell and calibrated it using our dead weight force machine. We believe we can realize the unit of force with this machine to about 0.0015 % or better (0.0015 % is what is found on our scope of accreditation) . The results listed below show a difference of about 0.012 % in output at full scale. This 0.012 % difference is about four times larger than the original reported uncertainty. If the compression calibration method is not listed on your certificate of calibration, I would suggest calling your calibration laboratory and asking how they calibrated your load cell in compression. We shot a video that shows a different test with similar results; the video can be found at http://www.mhforce.com/force.